McDonald’s workers in Britain called for a “McStrike” on May Day to demand three simple things: a £10 an hour minimum wage, the end of zero-hours contracts and the right to unionise, TeleSUR English said. Workers from at least five different branches in Manchester, Watford, Crayford and Cambridge walked out on May 1, the International Workers’ Day, to demand their labour rights, with the support of the country’s fast food and trade unions. 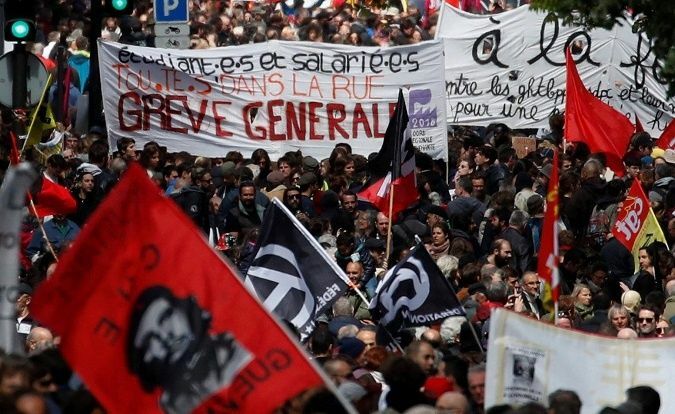 Demonstrations to mark May Day — International Workers’ Day, commemorated globally on May 1 — took place in cities around the world, as workers protested for their rights and celebrated their gains. Across France, about 150,000 people took part in labour marches, according to government estimates, up slightly on 2017. The United States was the scene of three large national mass mobilisations from April 22 to May 1 challenging President Donald Trump’s agenda. Hundreds of thousands of people filled the streets of San Salvador on May 1 to celebrate May Day and the victories of the working class. Marchers raised demands for justice, equality and self-determination, CISPES.org said on May 4. People around the world took to the streets on May 1 to mark May Day, the international workers' day. The day started in the United States in the late 1800s, when unions first called for an eight hour work day, but countries throughout the world soon followed suit in demands for better working conditions. Thousands of Venezuelans took part in May Day rallies on May 1 to mark the international workers' day and commemorate the achievements of the country's pro-poor Bolivarian revolution. Malaysian police have arrested Socialist Party of Malaysia (PSM) secretary-general S. Arutchelvan, formal President of Malaysian Bar Council Ambiga Sreenevasan and member of parliament for Seremban Anthony Loke at a May Day demonstration on May 1. The arrests are part of the recent wave of crackdown on anti-GST (anti-poor goods and services tax) and aim to further curtail dissent in the country. The biggest Labour Day march in Australia took place in Brisbane on May 5, as thousands of unionists marched through the city in celebration. More than 30,000 took to the streets across the state over the past weekend, expressing their anger towards the Campbell Newman government. Workers from a wide range of trade unions proudly participated, with large contingents from the Builders’ Labourers Federation and the Construction Forestry Mining Energy Union.